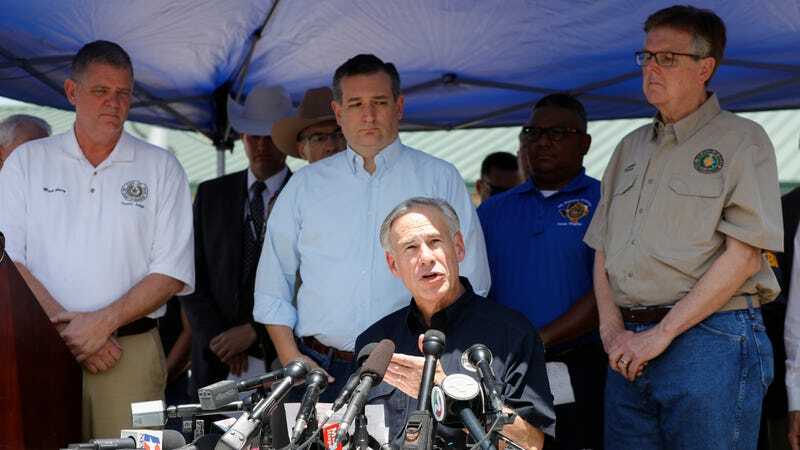 It’s been less than a week since 10 students were killed and another 13 were injured by a 17-year-old gunman in a mass shooting at Santa Fe High School, near Houston, Texas, and state officials are scrambling to avoid saying literally anything meaningful about gun control. There are all sorts of things that cause gun violence, according to Texas conservatives, except, of course, the sale and distribution of guns without universal background checks, gun purchase waiting periods, or any of the policies that would help to reduce violence. In the press cycle that has followed this most recent school shooting, nothing is safe from officials’ scrutiny—not pop culture, not reproductive rights, not even architecture. In the hands of Texas Republicans, gun violence becomes a problem that stems from nearly anything that is not a gun. This was another one of Patrick’s talking points, although it’s unclear how exactly single parenthood leads to gun violence. “We have families that are broken apart, no fathers at home,” he said on CNN; again on ABC, he said “the breakup of families” has been cause of “devalu[ing] life” in the U.S. What he won’t say directly directly, but is implicit in each of his comments, is that gun violence somehow rests on the shoulders of single mothers. Senator Ted Cruz, in addition to offering thoughts and prayers, had one clear explanation for the violence of last week: evil. Its face, specifically. “Once again, Texas has seen the face of evil,” he said, as reported by Fox News. The video games issue, we have got to address in this country. Based on all the research we have done, 97%, according to psychologists and psychiatrists ... of teenagers view video games, and 85% of those video games are violent. ... And what are these games showing you how to do? Kill people. ... The vast majority [of psychologists and psychiatrists] will tell you it leads them to become numb to violence, to have less empathy to their victims and be more aggressive. Does that impact everyone who views them? No, but it obviously is part of the problem. Hmmm. I don’t even know with this one. Or, as Patrick puts it, a failure to arm teachers, the people who spend the second-most amount of time with kids after parents, is essentially a breakdown within this country’s “well-run militia,” per the Second Amendment. In the video above, you can hear Patrick arguing that gun violence could be fixed by getting more guns into the hands of more people. Just, you know, people. It’s about us. Really moving stuff. We will update this post as more despicable blame-shifting becomes available. We probably won’t have to wait long!